We have a tasty new addition to the slots world from Playtech. 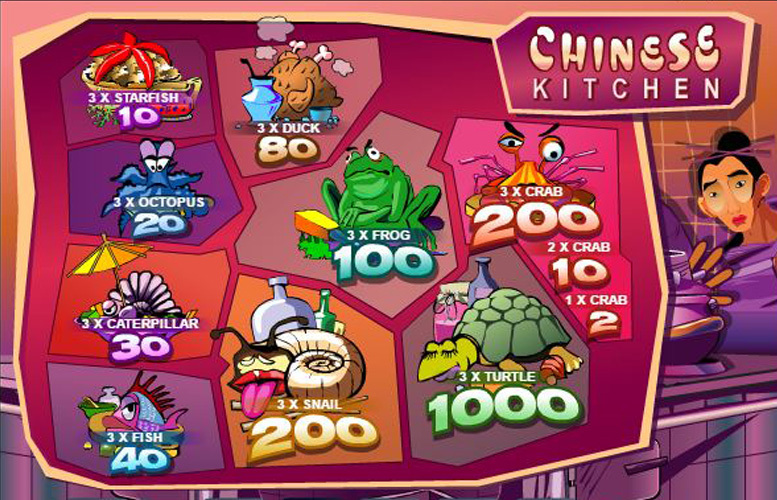 Chinese Kitchen Slot entices players with a colorful (and often humorous) artwork, simple game design, and is straight-up fun. There are some faults as well, but hey – no game is perfect. Let’s have a look at what’s cooking! The chef’s menu might be filled with lots of delicious recipes. On the other hand, his purse isn’t as rich as the taste of the curious food options. The Chinese Kitchen Slot has a measly 1000 coin standard Jackpot, and no progressive Jackpot. This might not be such a problem, considering it’s only a 3-reeled slot. When you have such examples as the Cat Queen Slot that offer the same Jackpot on a 5-reeled slot – it becomes a problem. In this case, we can overlook this fault. Three reels give you plentiful opportunities for monetary gain, considering how many winning symbols there are. As we mentioned before, the Chinese chef has plenty of exotic meals in store for you to try. The Starfish is the lowest-paying of the bunch (at 10 coins for 3x in a row), while getting three Turtles will net you 1000 coins. This is the standard Jackpot of the game – a fair prize for a 3-reel slot. Otherwise, Chinese Kitchen features other such foods as the Octopus, Caterpillar, Fish, Duck, Frog, and Snail. The chef’s winning recipe, however, is the Crab. Even getting one of these symbols on the reels will get you a small win of 2 coins. Why not land three of them on a payline and get 200 coins, instead? Actually, landing a single crab in the center of the reels will win you back the bet for that spin. It’s quite a helpful little crab, if a bit angry-looking. Then again, none of the other animals seem too pleased to be on the menu. The coin values are pretty standard for the genre. There’s a $0.01 minimum for a coin, and a $5 maximum for one. Be warned about the game’s “Line Bet,” however. Let’s say you bet $1 on a single payline – the game will show you that you’re betting $3. Our reasoning is that the game considers each component of a payline to be a separate coin. Why? Because of the Crab, of course. Remember that getting a single Crab symbol anywhere gets you 2 coins. This is the only possible explanation we could come up with. Perhaps the Chinese chef isn’t getting enough profits? In any case, watch out when betting on all lines. A $5 coin for 8 paylines is $120! It’s also the maximum you can bet in the game. When you compare it to other Playtech slots, it doesn’t sound like much at all. Still, it’s good to know the game’s rules if you don’t want to get confused. We genuinely enjoy the simplistic 3-reel approach that Playtech took with Chinese Kitchen. The sound effects and artwork are humorous. That angry Crab alone makes it worth a shot, even if you aren’t that into 3-reel slots. Plus, it offers quite the helping hand (or pincer, rather) in making some cash. They could have added some nice bonus games based on the theme. That would have added a bit of flavor to an otherwise bland series of “click Spin to win.” Another thing that might bother players in a hurry is the unskippable spinning animation. When you compare it to other Playtech slots, it seems to take forever. There are only so many times you can hear the splashy sound effect before it gets on your nerves. Luckily, you can turn the sound off if that’s the case. Veteran slot players might decry the lack of a more substantial Jackpot or a progressive one. Maybe even the absence of a bonus game or something to make things more interesting. 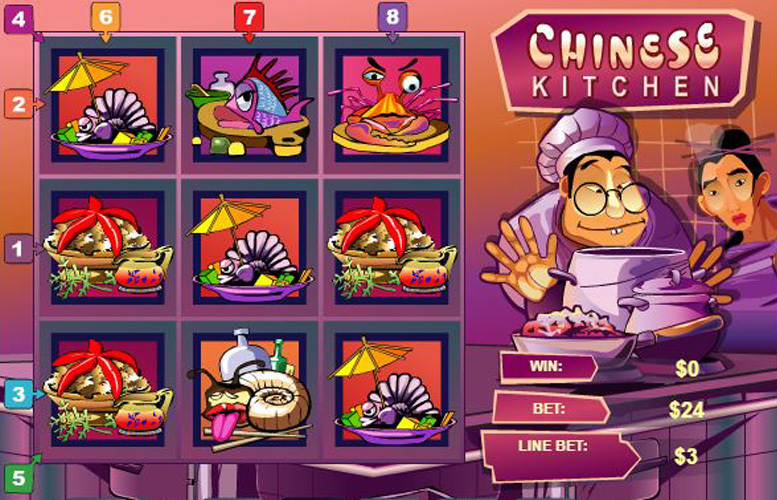 But when you take everything into account, Chinese Kitchen Slot is an enjoyable experience (if a bit short-lived). On an unrelated note: Does anyone else see the resemblance between the chef’s helper and the character designs in Disney’s “Mulan”? This game has a rating of 4 / 5 with 354 total reviews by the users.